As you jet off on your summer holidays, you’re probably not thinking about the impact on your home insurance policy. But it’s important to consider your cover as well as a few safety measures to ensure your home is safe and your insurance is valid while you’re away. Before you set off, it’s a good time to review your home insurance cover, or to take out contents insurance if you don’t currently have a policy. You might already have buildings insurance if you own your home, and your landlord will take care of buildings cover if you rent, but it’s important to consider your contents too. There’s no worse end to a holiday than returning to find all of your belongings have been stolen or damaged in a fire or flood — especially if you’re not properly insured. If you already have contents cover, you should check it still meets your requirements. It’s estimated that millions of households in the UK are underinsured because their contents insurance policy doesn’t cover the current value of their belongings. Most insurers will cover you on the assumption your property will be occupied most of the time. You will usually be covered unless your house is left empty for more than 30 consecutive days, but some insurers’ rules differ so it’s important to check your policy. If you are going on an extended break you should inform your insurer, but be aware that they may not be willing to cover you for the whole time you’re away. Alternatively you might want to consider having a friend or family member stay in your property for some of the time you will be away. As well as insuring the items you’re leaving behind, you should also consider covering those you’ll carry with you on your trip. 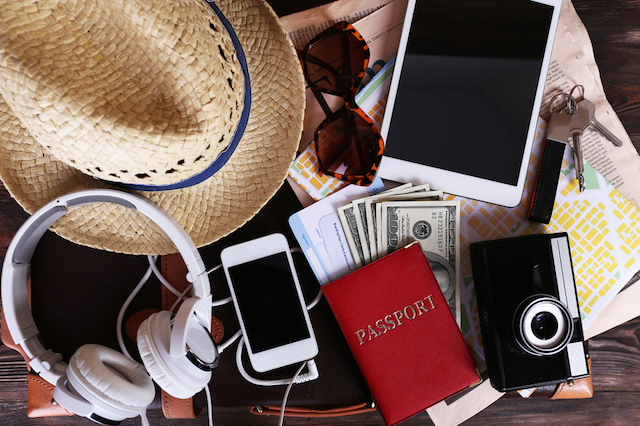 While you may be covered for some loss if you have travel insurance, most travel policies have a low single item limit which may not cover more expensive items such as smartphones, cameras or jewellery. Personal possessions cover is available as an add-on to your home contents insurance, covering the items you take out of the home. Most policies will also include cover abroad for up to 60 days, making it a great way to protect your gadgets and other belongings while you’re away. Some insurers may refuse to pay out on a claim if you have not taken due care to protect your property while you’re on holiday, for example leaving doors or windows unlocked. By following a few simple tips you could further reduce the risk to your home. Make sure you lock all doors, windows and outbuildings such as sheds and garages. Take care when posting about holidays on social media. Never share your address on your profile and don’t make your posts public. Better yet, wait until you are home before posting your holiday snaps. Don’t leave a spare key outside of your home — burglars know all the common hiding places and some insurers might not pay out on a burglary claim if there is no sign of forced entry. Cancel regular deliveries such as newspapers and milk to stop them from piling up. Have a friend stay in your home while you’re away or have them drop in periodically. Use a timer to switch on lights at random intervals to make it appear as though you’re home.